Chart No. 3 - Posterior Motor Currents Vital Energy. Second and Third Lumbar Space Is the Body Weight Center. Seven Joint Contacts for Motor Current Release. Also Contacts on Back of Hand and Top of Feet to Correspond to the Spinal Motor Area. See Chart No. 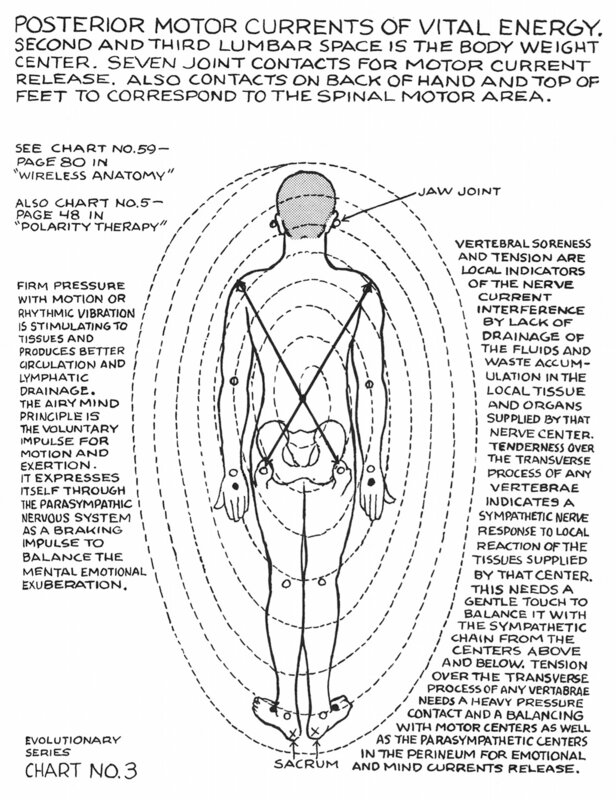 59 - page 80 in "Wireless Anatomy"
Also Chart No. 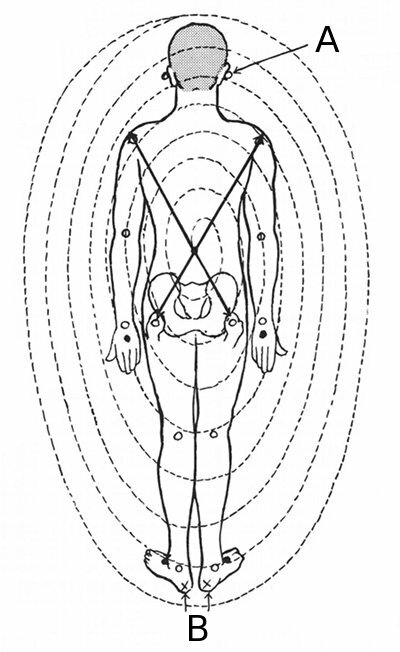 5 - page 48 in "Polarity Therapy"
Firm pressure with motion or rhythmic vibration is stimulating to tissues and produces better circulation and lymphatic drainage. The airy mind principle is the voluntary impulse for motion and exertion. It expresses itself through the parasympathetic nervous system as a braking impulse to balance the mental emotional exuberation. Vertebral soreness and tension are local indicators of the nerve current interference by lack of drainage of the fluids and waste accumulation in the local tissue and organs supplied by that nerve center. Tenderness over the transverse process of any vertebrae indicates sympathetic nerve response to local reaction of the tissues supplied by that center. This needs a gentle touch to balance it with the sympathetic chain from the centers above and below. 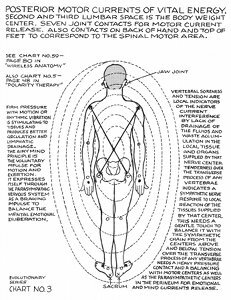 Tension over the transverse process of any vertebrae needs a heavy pressure contact and a balancing with motor centers as well as the parasympathetic centers in the perineum for emotional and mind currents release.